Get slim drinking fresh juice on the cleanse diet. To do that your are going to need an effective cleanse recipes for getting enzymes in your body for the best. What is a good cleanse recipe for getting slim? A good Cleanse Recipe is hard to find. Although you may not be looking for a natural colon cleanse recipes or even a lemon cleanse recipe, if what you are looking for is a way to get slim fast drinking fresh fruit juice with a cleanse diet spin. Drinking fresh juice has always been the thing between Hollywood celebs. There are even fresh juice bars specifically for the cleanse diet. Does "juice bar" ring a bell? Just because there isn't a juice bar near where you live doesn't mean you can't drink fresh juice to get slim. In this cleanse diet Slism, we introduce a simple and easy cleanse recipe to add to your inventory of great fresh fruit juices to drink while on a cleansing diet including apples, lemons, and carrots as well as green veggies like celery. The cleanse diet is where you replace your meals in a day with fresh juice made with ingredients such as apples, carrots, and celery Besides drinking fresh juice for breakfast lunch and dinner, the cleanse diet asks that you drink a glass of fresh juice between meals. 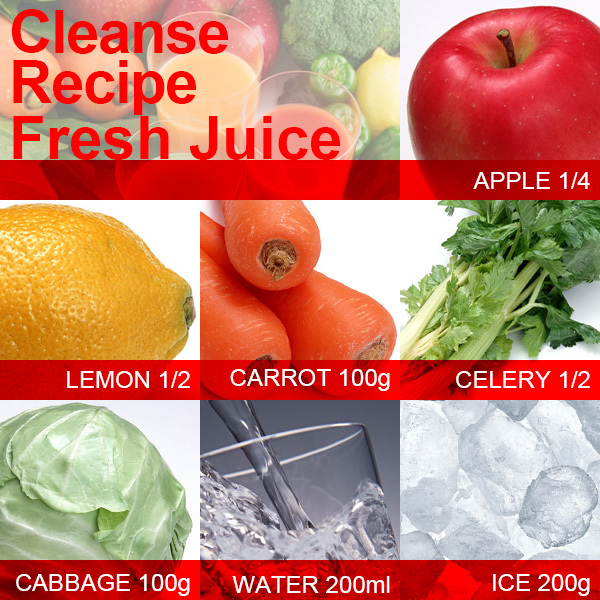 Due to the fact that it is a cleanse diet, you will have to stick to drinking only fresh juice. That is why it is only for few days. Unlike other cleansing diet, this diet shouldn't be continued for long periods of time. Be sure to keep yourself hydrated getting enough water in your body and avoid drinking too much caffeine, alcohol, and carbonated drinks. On the cleanse diet you will be drinking fresh juice packed with nutritious vegetables and fruits. Despite that, it is not a diet you want to carry out for a long time. For best results, only go on the cleanse diet for 3 to 5 days max. Mix the above ingredients using a mixer thoroughly. Drink juice fresh right after making to get more enzymes in your body for best results. That means making this cleanse recipe right before its time to drink. The minerals such as potassium and enzymes in fresh juice help to flush out toxins from your body and even promote healthy weight loss by giving your body the right amount of sodium combined with proper hydration. In addition to helping you detox your body, the cleanse diet is said to speed up your renewal metabolism. By detoxing your body drinking fresh fruit like the cleanse recipe introduced in this column you can clean your body from the inside out. That means in addition to the advantages that drinking fresh fruit gives you in your diet, it is not to shabby when it comes to beauty. In order to get the most out of the diuretic effect of the cleanse diet, proper hydration while dieting is key. 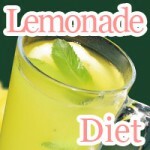 The lemonade diet may not care about your health but still helps you shed pounds fast. Find out why drinking maple syrup and lemon juice works.